Log in to PuTTy on the mobile device. 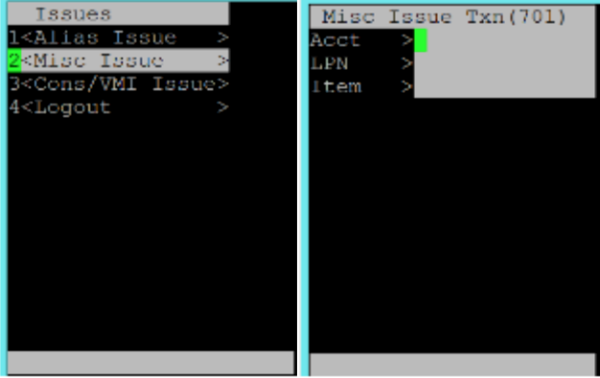 From the Miscellaneous Issue page, select Responsibility > WHSE Mgmt > Warehousing > Inventory > Issues > Misc Issue. In the Acct field, enter the adjustment account for the issue and the corresponding receipt. In the LPN field, enter the LPN you want to transact. Note: The LPN must be physically located at the current organization. Optionally, in the Reason field, you may enter a reason for the issue. From the Sub Transfer page, select Responsibility > WHSE Mgmt > Warehousing > Inventory > Transfers > Sub Transfer. Enter the LPN you want to transfer from. In the To Sub field, enter the subinventory you want to transfer the LPN to. In the To Loc field, enter the destination locator for the LPN. Optionally, in the Reason field, you may enter a reason for the transfer. 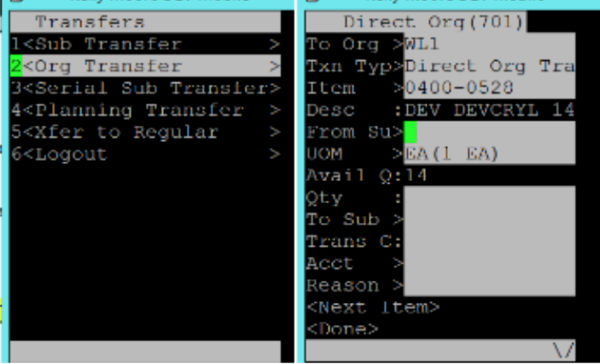 From the Sub Transfer page, select Responsibility > WHSE Mgmt > Warehousing > Inventory > Transfers > Org Transfer. If necessary, enter the organization to transfer from. Enter the organization to transfer to. Note: You can only transfer LPNs to organizations that use Oracle Warehouse Management. Optionally, in the LPN field, enter the LPN that you want to transfer. Note: If you don't enter an LPN, you must enter the Item, Subinventory, and Locator information. In the To Sub field, enter the destination subinventory. In the To Loc field, enter the destination locator. We hope this post helped you gain an understanding of how to work with LPNs in Oracle WMS by using a mobile interface. It explains various inventory transactions that you can perform with LPNs. Thanks to LPNs, these transactions process quickly. LPNs simplify management for organizations with large warehouses. Have you used LPNs in Oracle Warehouse management through a mobile interface? Join the conversation by leaving a comment below.